Parents may have heard and read stories about an online safety / social media concern called the 'Momo Challenge'. 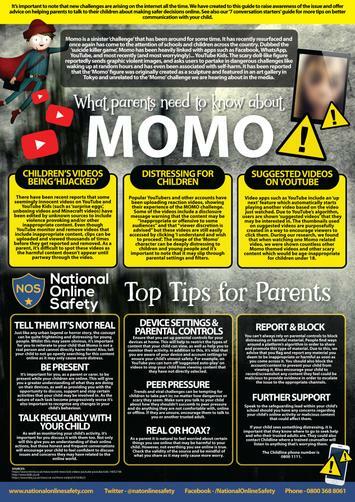 Please follow the following link which gives excellent parent guides containing advice and explanation on the Momo Challenge, Instagram, SnapChat, Fortnite and a wide range of other popular apps, games and potential dangers. PLEASE monitor your child's online usage and talk to them about the content they are accessing. If you have any concerns or would like to learn more, please contact the school office to arrange a meeting.